Reserve Bank of India (RBI) has announced its first Bi-Monthly Monetary Policy Rates for 2019-20 in Mumbai today. 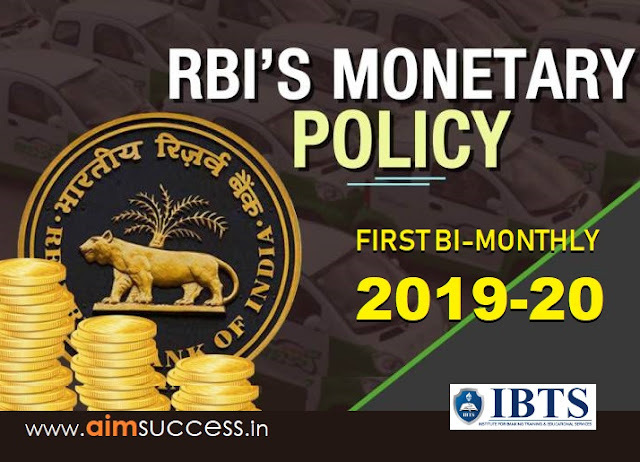 First Bi-monthly policy has been released based on the assessment of the Monetary Policy Committee of the Reserve Bank of India (RBI). Monetary Policy Rates are crucial for the exam, especially Banking awareness. The three-day policy review meeting by the Monetary Policy Committee (MPC) headed by RBI Governor Shaktikanta Das in Mumbai. It is the rate at which RBI lends money to commercial banks. It is the rate at which RBI borrows money from commercial banks. The share of net demand and time liabilities (deposits) that banks must maintain a cash balance with the Reserve Bank. The share of net demand and time liabilities (deposits) that banks must maintain in safe and liquid assets, such as, government securities, cash, and gold. It is the rate at which the Reserve Bank is ready to buy or rediscount bills of exchange or other commercial papers for the long term. The rate at which the scheduled banks can borrow funds from the RBI overnight, against the approved government securities is termed as MSF.